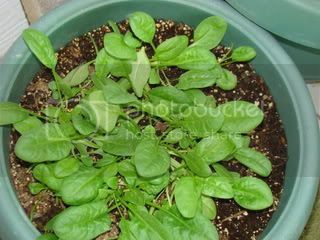 My spinach is finally beginning to look like spinach. The lettuce that I planted in a hanging basket just isn’t looking very good with very little growth. I am so very pleased that I have a small spinach crop on my side porch. 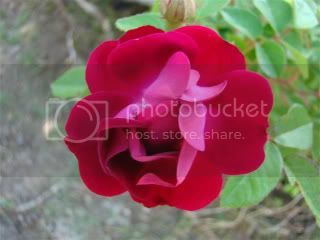 First rose of spring. 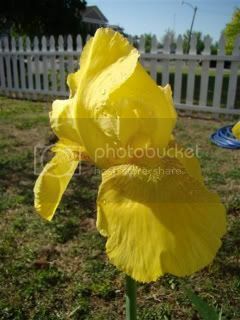 I am hoping these will eventually grow over my arbor. 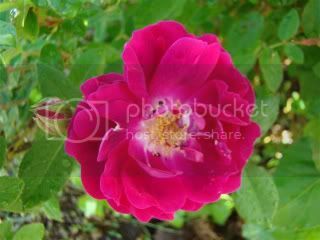 Second rose of the season…. 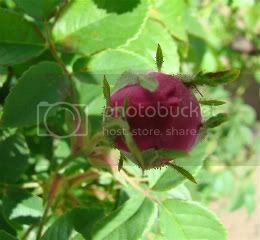 First bud on the sideporch…. As an end of the year gift one year, my students gave me a gift certificate from Headrick’s Nursery to purchase a tree. 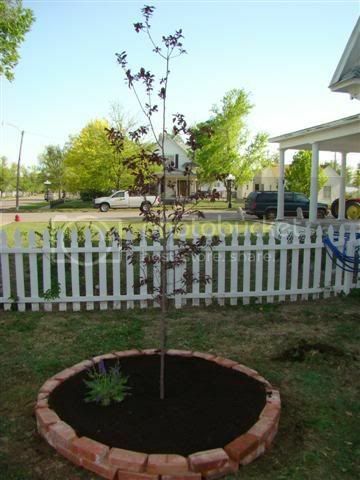 This is the second year the tree has been planted, but part of my Mother’s Day gift was to make a flower/herb ring at the base. 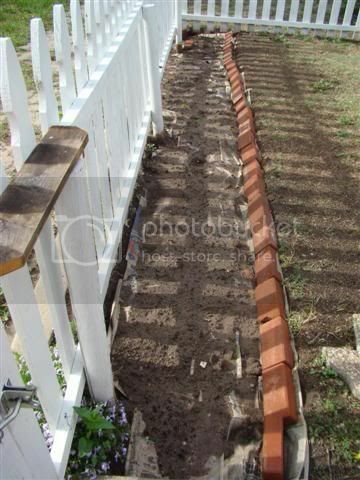 We used reclaimed bricks from a building that was torn down in Mullinville and some of my new compost. I transplanted a plant from another location in my yard. Unfortunately, right after it was planted, Blondie (the Wonder Dog) decided to take a walk and take in the new aromas from my exquisite compost. 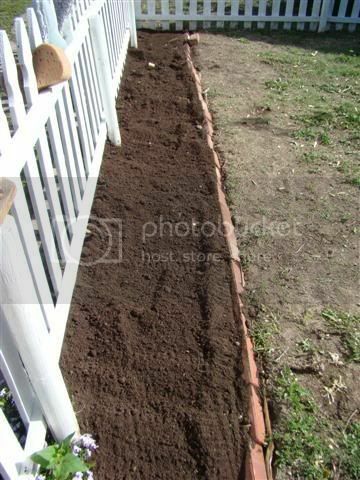 We also filled the new vegetable bed with the new compost. I can hardly wait to start planting. 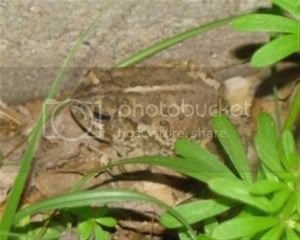 The other day while I was in the backyard, I had the bejeebers scared out of me by my first little toad of the season. 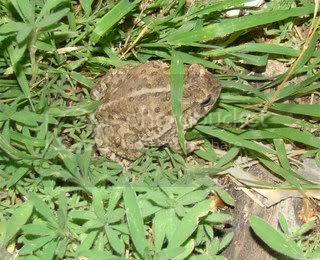 I am not afraid of toads, but there was unexpected movement as I was walking down our “half-built” walkway and it not only startled me, but I was afraid I was about to step on it. Of course by now you know that I wanted to share a photo, but the little darling had disappeared by the time I returned with my camera. Tonight, as the storms were about to arrive, DH and I were out covering my new plantings and the baby came back out…along with three other friends. They have all been hanging out in my rock pile. Who knew that I had inadvertently created a frog/toad habitat by stacking my stones? As soon as this weather clears out, I will have to make them an acceptable abode post haste. 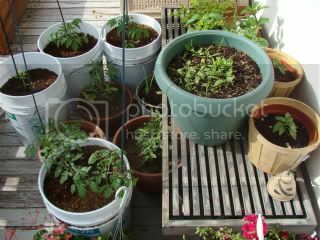 I am certain I have some broken pots that can be placed deeply into my herb garden for a cool, shady spot. Before today, I had no idea that this event existed. I know that August 24 is a few months in coming, but I thought I would post this interesting video about the need for turning our lawns into vegetable gardens. The gentleman in the video discusses the many reasons why everyone should dedicate at least some portion of their lawn to a productive garden, but his mention of $3 gasoline dates it slightly. Oh wait…$3 wasn’t that long ago….the fear of $4 gas is becoming more and more real. “What is that yuk in the bucket on the sidewalk outside mom? It is gross!!!! !” That is the first thing I heard from my DD when she found my deep, dark, bison manure tea steaping in a bucket in our side yard. Normally, I would place the manure in a cloth bag attached to a stick so the manure will be easy to remove from the bucket, but this time around I just floated the manure in the water. 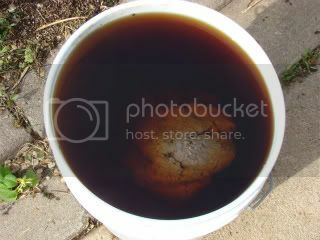 My plan was to dip the tea out as I used it and then dump the remains into the compost pile, however with the rains and, consequently, muddy yard I have not used even a drop yet. In the meantime, we will have to deal with the brown liquid gold sitting where everyone can see. I will plan better next time. Well, ended up not to be a freeze, but I just couldn’t take that chance. 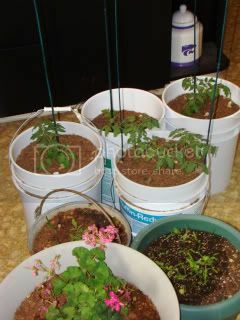 The plants that could be brought inside rested in the kitchen overnight and the others were covered with various buckets and pots. The temps got down around 33-35 degrees, but neighboring towns were not quite as lucky. A few days later, we were running from the threat of hail. Luckily, I could bring my plants up to the side porch for protection.